For the Saint Seiya character, see Cancer Deathmask. For the episode of the television series Rome, see Death Mask (Rome). For the video game titled "DeathMask", see Angel Devoid: Face of the Enemy. 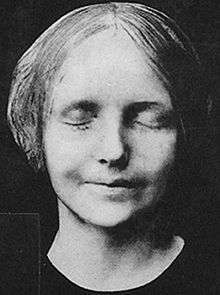 A death mask is a metallic, wax or plaster cast made of a person’s face following death. Death masks may be mementos of the dead, or be used for creation of portraits. It is sometimes possible to identify portraits that have been painted from death masks, because of the characteristic slight distortions of the features caused by the weight of the plaster during the making of the mold. In other cultures a death mask may be a funeral mask, an image placed on the face of the deceased before burial rites, and normally buried with them. The best known of these are the masks used by ancient Egyptians as part of the mummification process, such as Tutankhamun's mask, and those from Mycenean Greece such as the Mask of Agamemnon. In the 10th century in some European countries, it was common for death masks to be used as part of the effigy of the deceased, displayed at state funerals; the coffin portrait was an alternative. Mourning portraits were also painted, showing the subject lying in repose. 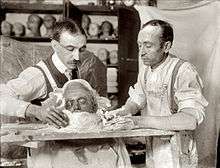 During the 18th and 19th centuries masks were also used to permanently record the features of unknown corpses for purposes of identification. This function was later replaced by post-mortem photography. The use of masks in the ancestor cult is also attested in Etruria. Excavations of tombs in the area of the ancient city of Clusium (modern Chiusi, Tuscany) have yielded a number of sheet bronze masks dating from the Etruscan Late Orientalising period. In the 19th century it was thought that they were related to the Mycenaean examples, but whether they served as actual death masks cannot be proven. The most credited hypothesis holds that they were originally fixed to cinerary urns, to give them a human appearance. In Orientalising Clusium, the anthropomorphization of urns was a prevalent phenonmenon that was strongly rooted in local religious beliefs. In Russia, the death mask tradition dates back to the times of Peter the Great, whose death mask was taken by Carlo Bartolomeo Rastrelli. Also well known are the death masks of Nicholas I, and Alexander I. ↑ H.W. Janson with Dora Jane Janson, History of Art: A Survey of the Major Visual Arts from the Dawn of History to the Present Day, Englewood Cliffs, New Jersey, Prentice-Hall, and New York, Harry N. Abrams, 1962, p. 141. ↑ N. Steensma, Some considerations on the function and meaning of the Etruscan bronze "masks" from Chiusi (seventh century BC), in: H. Duinker, E. Hopman & J. Steding (eds. ), Proceedings of the 11th annual Symposium Onderzoek Jonge Archeologen, Groningen 2014, p. 65-74. ↑ "Portraits of the Presidents". National Portrait Gallery, Smithsonian Institution. Smithsonian Institution.